This past week I read a story in the Engisn magazine (published by the Church of Jesus Christ of Latter-day Saints) that really had a great idea for bedtime stories. With four kids, I'm always being asked to share some kind of great story to help the kids fall to sleep, but generally the stories I share are more for company's sake, rather than helping the kids get sleepy. Usually they involve leprechauns, fairies, princesses, or squirrels. "... I often used scripture stories as bedtime stories. In later years my daughter shared how influential this was. She said, 'I think stories that were told over and over again became favorites for us. You sat beside our beds and shared the stories from the scriptures. We loved them and asked to hear them again and again because even at that age we could feel the spirit of the message they carried and knew the people you were telling us about were valiant and faithful. We wanted to be like them.'" With this in mind, I tried it. For the past several nights, I've been sharing stories from the Book of Mormon with my oldest son. Lucky for him, the stories involve cutting off arms, people being struck dead, and promises of missionaries never being killed. And he totally eats it up. 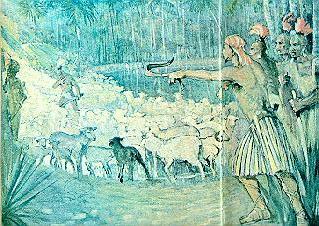 When I told him about a man trying to kill Ammon (the second Ammon –did you realize there are two different Ammons in the BoM? ), while lying on the floor with King Lamoni and his wife, and the man was struck dead as he lifted his sword to kill Ammon, my son's response was, "NO WAY!!!" He totally thought it was cool. Not necessarily that someone died, but to witness the power of God in action –the promise of God in action. Very cool, I'd agree. The added benefit of sharing scripture stories with your kids is that once they're addicted, you have no excuse to not keep up with your own scripture studies. Personal study every day is a must! Let me know if you too try this one out on your kids. I'd definitely recommend it to a friend!